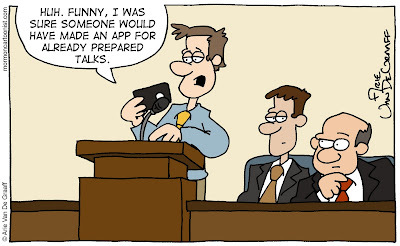 Ward Cartoonist: Win a Free Copy of the LDS Coloring Book! Win a Free Copy of the LDS Coloring Book! Let me give a few more details about the LDS Coloring Book app for the iPad and iPhone. Last week I mentioned a $2.99 price, the price for the app is actually $1.99. With your purchase of the app, you receive 12 Old Testament pages to color. If you subscribe to the LDS Coloring Book newsletter (look for the banner at the bottom of the app), you'll receive 12 missionary-themed pages to color illustrated by me (look for the Elder Van Dyke cameo appearance). 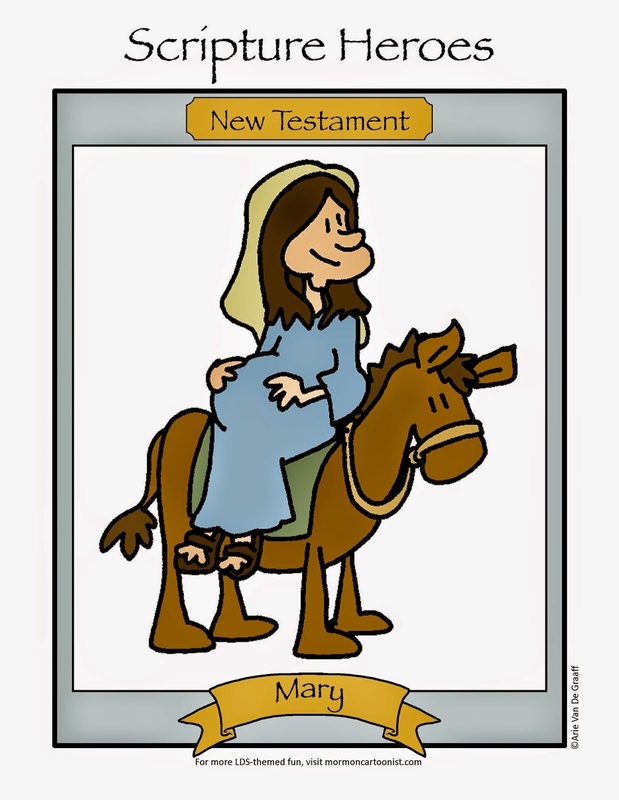 Additionally, you can go to the app's store and purchase 12 New Testament pages (also drawn by me) for another $1.99. Every month, the app will introduce another 12-page coloring book. Future coloring books include a Book of Mormon-themed book, a Church history-themed book, and an Articles of Faith-themed book (with an extra page thrown in for free!). You can purchase these coloring books individually for $1.99 or you can set up an ongoing subscription for the app and receive each additional coloring book for $0.99 each with the option to cancel at any time. Seeing as how you'd be getting two books for the price of one (with an extra penny to spend on whatever you want), I'd suggest you subscribe. Details on how to subscribe can be found here. To celebrate the launch of the app, I'm giving away the codes for two free copies of the LDS Coloring Book. Simply leave a comment with this post before Monday, September 26 and you'll be entered to win. I'll draw two names randomly and announce the winners Monday morning. Arie, Good luck on your new app, hope it does better than BYU did against Utah (too soon?). I like how the Bishop is giving the speaker the stink eye. I am sure he is thinking, "how would you like a stint in the nursery!" I'll pass on the drawing, don't have an iPhone or iPad. 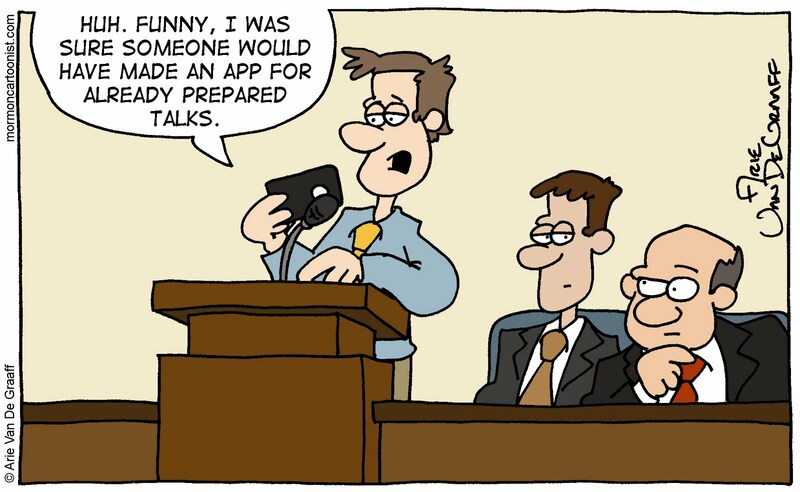 Your new app sounds AMAZING! I have always loved your books and comic strips. Even having a lot of missionary friends out, I actually color your missionary pages and send them to them! I bought the Old Testament coloring book, and my children are LOVING it! Does the drawing only include that specific coloring book, or would the code work for one of your other coloring books? Id love to get the whole collection of them! You are very talented! Karen, the code would work for two of my coloring books (the New Testament and the Book of Mormon), I'll keep your name in for the drawing. And don't forget to sign up for the newsletter to get my missionary coloring book for free. Dangit. Why can't I own an iphone? This gives guys another reason to bring their phones to church. So when they're checking the scores to football games that they're missing, they'll tell their wives that they're coloring a B of M page for the kids. I really could have used this app two weeks ago when my nephew was sitting with us and wanted to play "connect the dots" with me the whole sacrament meeting. We love your work Arie! Awesome, thanks for your reply Arie. I signed up for the newsletter, and we are really enjoying your missionary coloring book! Thanks. I'm happy to share it.